ReadySet premium lessons motivate students with engaging, focused lessons, immediate feedback and game modes. 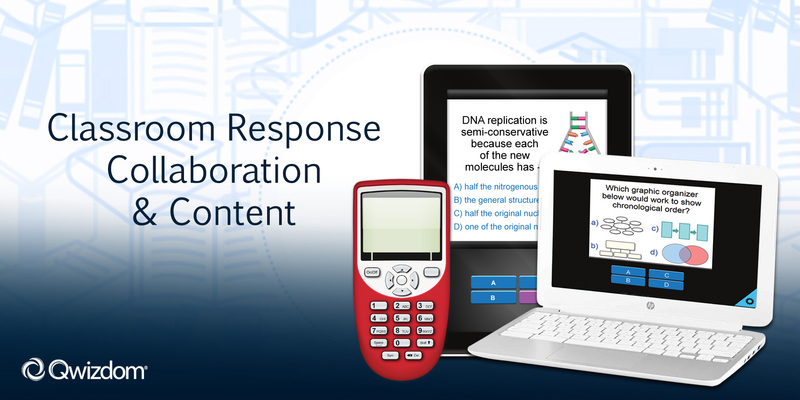 Use materials live in the classroom with Qwizdom student response systems, QVR response app or Notes+ Collaboration App. Lessons and assessments can also be assigned to students for self-paced, online learning through Oktopus Blend (learn more). This flexible delivery allows content to easily supplement any learning program. Pre-made, standards-aligned lessons are written by master teachers to simulate what students will see on state tests, as well as reinforce concepts and skills learned in district-mandated pacing plans. Pretest: Each grade level package begins with a pretest, providing teachers with a quick and complete evaluation of previously attained knowledge and student mastery of state-determined key concepts. Based on the results of the pretest, teachers can tailor instruction by whole class, small group, and individual student. offering clues or partial solutions to help strengthen cognitive thinking. The lessons include follow-up questions with explanations of answer choices to help students understand what led to the correct choice, thus reinforcing the concept or skill. Practice Tests/Quizzes: Teachers also have available to them benchmark quizzes and practice tests on smaller amounts of material, which help to further guide the development of personalized instruction. Posttest: Posttests are included in each package and can be given before the administration of state assessments, providing additional information for targeted reteaching of content and test-taking skills. ReadySet can be presented with the QVR student response app? ReadySet can be used in Oktopus Software? Download and play 1,000s of lessons using over 70 interactive teaching widgets to help reinforce key concepts and skills. Assign lessons to individual students, groups of students or the entire class for targeted, self-paced learning. ReadySet Mini-Lessons are specifically designed to provide students with small chunks of information that they can assimilate to their knowledge base, as they comprehend new concepts and skills. ReadySet digital content can be played on AutoPilot with our response clickers using Qwizdom Connect software that comes free with the purchase of a set? Run a lesson on AutoPilot as students enter the classroom while you monitor the hall or prepare for the coming class. Before class, lay out remotes and select the following options in the Presentation Setup window: Participant List ‘Anonymous’ and Present As ‘Presentation on AutoPilot.' I hope this article provided you with some ideas on how you can use ReadySet Premium Lessons. Please share how you use Qwizdom to improve learning in your classroom. I hope this article provided you with some ideas on how you can use ReadySet Premium Lessons. Please share how you use Qwizdom to improve learning in your classroom.